I’m struggling a bit at the moment. I don’t really know why. Nothing has changed much, but maybe that is the problem. Little J still isn’t sleeping. He might have to odd night or two when he will sleep until 5 or 6am, but generally he will wake up constantly until he is in our bed, then spend the rest of the night practising to be the next Karate Kid. It’s not through trying either. I think I have tried every trick in the book(s) over the last 5 1/2 years, apart from cry it out, which I point blank refuse to do. I don’t know of many other 5 1/2 year olds who are still struggling to sleep through the night. I feel like I’m back to square one again with my running. Everyone around me seems to be progressing. They seem to be hitting their milestones and getting stronger. Me, I’m trying to deal with the relentless onslaught of niggles in my legs. My quest to find an answer took me to see a very knowledgeable lady at Bosworth Clinic just outside of Oxford. She was fantastic and has shown me where the likely weakness lies. I’m doing the exercises religiously and have started using a metronome to increase my cadence when running. This has dramatically affected the speed and effort for every run. They all feel laboured and are much slower. I can’t seem to work out how to run at different speeds whilst keeping the cadence at around 180. In fact, I’m lucky if I manage a mile at 180 cadence, even with the metronome beating in my ear. With only 117 days until Berlin Marathon, constant pain in my leg and no seeming progress over the last two weeks, I’m feeling rather panicked. Boston Marathon places should come live in the next week. I’m so upset about my inability to run properly, I’m seriously considering scrapping my dream. There are so many things in my life at the moment which make me feel I’m useless. I won’t bore you with them all. I feel like I try so hard, have so much resolve, follow the plan and am still at the start line. Social media does not help, of that I’m convinced. People are able to paint such perfect pictures of their lives. I’m sure on the surface mine looks the same. If I’ve made you feel crappy, I apologise. When I feel like giving up, I look around and try to be thankful for all I have. I have a wonderful family, a lovely home, I don’t really want for anything (not just materially). Most of my struggles are based on my perception of my progress, compared to others around me. Oh my days, social media, what are you doing to this world? The truth is, what does it matter Little J doesn’t sleep through the night? Yes we could do with more sleep, but it is more important he feels safe, loved and protected until he works out he is all those things, even when he is on is own. What does it matter if I’m never any better at running. As long as I respect and take care of my body and try and help it along the way. It is not going to change the world if I achieve a sub two hour half marathon. Fighting against these things and worrying about my lack of progress will however rob me of my happiness. Crying myself to sleep because I feel a failure is going to hurt all the people around me who matter. 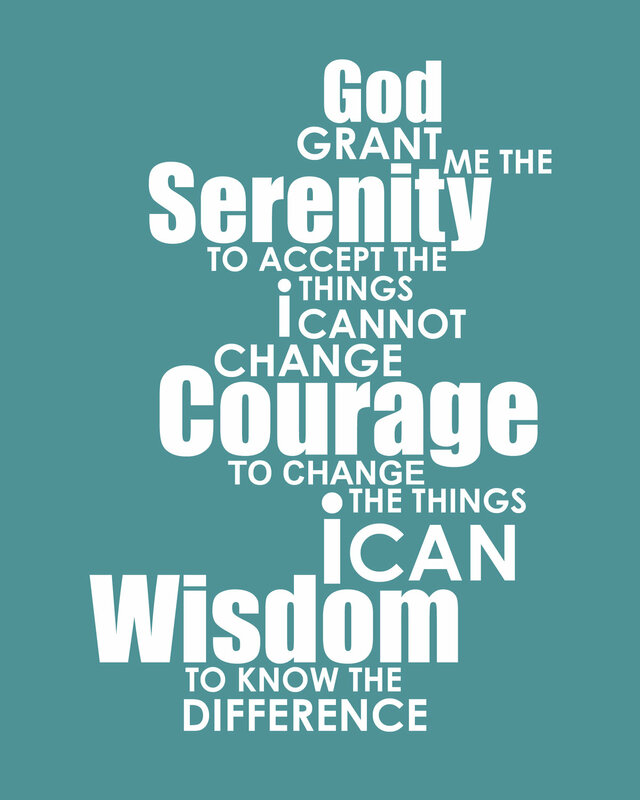 I’m going to make a choice to follow in Charlie Engle’s example and say the serenity prayer. To accept the things I cannot change, courage to change the things I can and look for the wisdom inside me to know the difference. His book The Running Man is great by the way. I still don’t know if it is wise for me to sign up for Boston, but I do trust I will know the answer to the question when the time is right. Lisa, you are doing just brilliantly, please believe that! We are none of us superhuman and I’m sure that if you asked any of your friends they could effortlessly list some of the things that make you amazing and special, just the way you are.